In this review, we look at Shark’s cordless stick vacuums, which includes the ION and IONFlex models. There are a ton of variations of the Shark ION cordless stick vacuums, and they have some combination of “ION,” “Flex,” and “MultiFLEX” in their name. All of the latest models come with the DuoClean cleaner head, a dual-brushroll system with a paint-roller style brushroll in the front designed for cleaning hard floors. We don’t recommend purchasing models without the DuoClean brushroll as you’re missing out on a great feature and the model likely just isn’t worth the cost. This article is part of our review series on Shark vacuums. Here we look at Shark’s cordless stick vacuums and make some comparisons with their biggest competitor: the Dyson V Series. You can take a look at our Shark Vacuums Overview to see our reviews of all Shark vacuums. With the 2 ION battery packs included, you get a total of 80 minutes of runtime in Handvac Mode and 50 to 60 minutes on carpet or hard floors. This is the longest runtime we’ve seen from a cordless stick vacuum. Having a swappable battery pack is one of the best design decisions Shark made with their cordless stick vacuums. The top competitor, the Dyson V10, squeezes out 40 minutes on hard floors and around 20 minutes on carpet, depending on which suction setting you use. But you can’t even swap out the battery for more time. Read our complete review of the Shark ION F80 Cordless Stick Vacuum here. 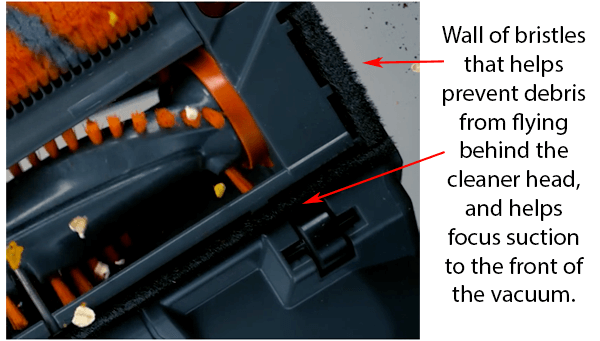 The cleaner head lid pops off for easy access to the brushroll for cleaning. Stands up on its own using the MultiFLEX feature. No leaning against a wall. Detaching the handheld from the pipe and cleaner head are super easy. Does NOT have the Anti-Allergen Complete Seal with HEPA Filter. You have to make sure to keep both batteries charged. Let’s unpack some of the information we’ve summarized above about the Shark ION F80. The Shark ION F80 is capable of running longer than any other Shark cordless vacuum, but keep in mind this is a stick vacuum with limited capacity. It’s really nice to be able to quickly vacuum an entire small house or apartment without having to bounce between different wall outlets. However, if you try to use stick vacuums for more than touch up cleaning or spot cleaning larger messes, then be prepared to empty the dustbin two or three times. The handheld, MultiFLEX pipe, and cleaner head click together and feel solid. It’s fast and easy to just pop off the cleaner head with the foot pedal and use the vacuum as a handheld to reach high places. This type of stick vacuum beats out the old upright-style Hoover Linx stick vacuums not only in performance but versatility as well. With those old-style stick vacuums you couldn’t use them for above-floor cleaning, and even with the 2-in-1 models you had limited reach and poor suction. These different designs also brought a small problem that has only recently been tackled by Shark: they can’t stand upright on their own. Since the majority of the weight is in your hands at the top of the vacuum, it’s just not possible to leave them standing by themselves. Shark’s answer to this problem is the MultiFLEX pipe that goes between the handheld and the cleaner head. The joint in the middle of the tube lets you easily fold the handheld portion down so that it rests above the cleaner head. While it looks somewhat awkward, it’s a solution. We haven’t seen Dyson approach this problem yet. People have been wanting a swappable battery for ages on the Dyson V Series, but they just haven’t listened. It’s a simple way to double the runtime and Shark has done just that. Our main complaint is that the Charging System that’s included with the F80 can only charge one battery at a time. It’s only a problem when you forget to charge one of them and need it. The P50 is like a stick vacuum on steroids. It’s bigger than the F80, but arguably has better versatility due to the Powered Lift-Away feature. The dustbin is larger than the F80, but still falls short of the Dyson V10 by about 25%. The battery is removable, but only one is included. If you purchase an extra battery you effortlessly double the runtime. This machine is a great option if you don’t mind the extra weight. Plus this is the only Shark cordless with the Anti-Allergen Seal + HEPA Filter. Read our complete review of the Shark ION P50 Cordless Upright Vacuum here. Powered Lift-Away Mode has amazing versatility. Vacuuming a vehicle is easier with the P50 than with the F80 due to the handheld portion being smaller. Heavy for a cordless, but the Lift-Away mode nearly solves this problem. If you had to pick just one, then the Shark P50 is our most recommended model. Even over the Dyson V8 and V10. It’s just that good. The major selling point of the P50 is the Powered Lift-Away mode. The entire canister portion of the vacuum lifts off the pipe that you see it resting on, and you can push the cleaner head around with your dominant hand while holding the canister in the other. This results in overall less weight in your dominant hand and less wrist strain than the Shark F80 and Dyson cordless vacuums. The Shark IONFlex 2x DuoClean (IF251) is the older version of the Shark ION F80. You’ll notice the significant difference between the two is the battery runtime in all modes. The F80 gets significantly longer battery life, generally 50% higher than the older model. If you’re looking to save a little money, we think the Shark IF251 is still a solid choice, especially if you have a smaller home or just plan on using it for small areas. You still get the DuoClean feature and similar attachments. Their dustbins are the same size as well. We still think the P50 and F80 are the best regarding features and performance, so we’ll continue below and look at that in detail. In this section, we’re going to take a closer look at our two top models: the Shark ION P50 and F80. The Shark P50 is just a different animal. It’s cordless, but it’s built like an upright and doesn’t have the MultiFLEX feature, but it doesn’t really need it anyway. It can stand up on its own without leaning it against a wall and can be converted to Lift-Away mode just like the full-size, corded Shark uprights. Now, if you’re familiar with the Dyson V series, then you know that to power on the vacuum you have to hold a trigger. With the Shark ION cordless vacuums, there is no trigger. You just push a button, and it stays on. See below. The idea behind the trigger is that you can seamlessly power the vacuum off between the areas that you want to clean and conserve battery life. It makes sense, but many people find the trigger to be annoying. I don’t mind it, but if you intend on vacuuming several rooms or a large area, then it does get tedious. It just doesn’t help if you don’t actually need to turn the vacuum off. The button on the Shark ION pictured above it right above your hand. You can just move your thumb up and turn it off. The Shark ION vacuums with “FLEX” or “MultiFLEX” in their name simply means there is a pivot point in the vacuum’s hose. This means it can stand up on its own without you having to lean it against a wall or furniture. The MultiFLEX join allows the handheld portion of the vacuum to bend down and rest just above the cleaner head. This lowers the center of mass and makes the vacuum stay upright. Bad back? MultiFLEX can also be used to help you vacuum under furniture without having to bend over. MultiFLEX is included on the Shark ION F80 Cordless Stick and Shark ION 2x DuoClean. Main Point: Between the Shark and Dyson cordless stick vacuums, the Dyson V8 has the most hygienic and easy emptying mechanism. Among the Shark cordless vacuums, the P50 is our favorite. Many people are considering the Dyson V10 and V8 when looking at the Shark cordless vacuums, so let’s talk about the differences. Cordless vacuums notoriously have small dustbins. It just comes with the territory. The Shark P50 has the largest dustbin among the Shark cordless vacuums. However, the Dyson V10 has pulled ahead in this category. See the table below. It’s not just size that matters, but also how easy it is to empty. Bagless vacuum dustbins notoriously require you to dig out, with your hands, hair, and dust that gets tangled around inside the dustbin. Shark’s dustbins are reasonably easy to operate, but just aren’t as hygienic as the Dyson V8 and V10. The new Dyson V10 dustbin design, while being larger, is somewhat awkward to use. You need to remove the wand to empty the dustbin, and it just seems more difficult to get the release mechanism to work right. That’s why we prefer the V8. Check out the video below our table for a demonstration of the V8 and V10. I just want to emphasize that this isn’t a clear win for Dyson over the Shark F80 and X40, but it does, in fact, have a larger dustbin. That gives you an idea of what you get with the Dyson V Series. Now, below we have the Shark IF205 dustbin, which is essentially exactly the same as the Shark F80 and X40 dustbin. It’s a straightforward release mechanism, but as you saw from the video, the Dyson is very different. 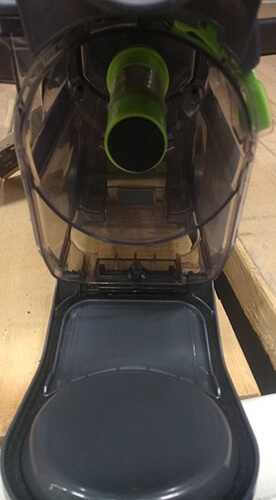 The body of the Dyson handheld lifts out of the dustbin and helps push out all the junk inside. That’s nice. You can see how the cylinder in the middle will end up with hair and dust wrapped around it, especially if you don’t empty it frequently enough. Opening the dustbin on the Shark F80, X40, and IF205 is as simple as pushing the empty button. What About the Shark ION P50 Dustbin? As we said before, the P50 is almost in a different class. It’s more like an upright than the other cordless vacuums we’re looking at here. The volume up to the “Max Fill” line is only slightly less than that of the Dyson V10 and is larger than the V8. Here’s a quick look at the P50 dustbin at Vacuum Wars. The P50 is an excellent option if you can stand the price. At the time this was published, the P50 is less expensive than the Dyson V10, and we think it’s a better value with more convenient features. More batteries = Longer Runtime. Shark includes 2 batteries with the F80, and you have the option to buy additional batteries with the other Shark cordless models. Dyson’s batteries are not removable, and this just isn’t possible. Perhaps the most contentious topic of cordless vacuums is the battery. Manufacturers throw out big numbers to entice you, but then tell you that’s how long it will last without the cleaner head attached and not vacuuming carpet. As if the main function of the vacuum is to operate without the cleaner head. Spoiler: it’s not. So here we’re looking at the different runtimes as quoted by Shark, and their competitor models from Dyson. Shark ION F80 MultiFLEX Cordless – Using the 2 batteries that are included. Keep in mind, the Shark ION F80 comes with two batteries, and we’re showing the combined runtime from both batteries. All the numbers you see above are in the normal power mode, and you can expect less than half the runtime shown if you switch to Max Power on all the Shark and Dyson models. Is the normal power mode enough? Well, yes. The suction seems to be just fine, but you might need to make an extra pass to pick up huge messes. Most of the time you’ll just be amazed at how well they perform. On all the Shark models, it’s easy to switch between the different floor modes. You have buttons that are within your thumb’s reach. Also, keep in mind that when switching between floor types on the Shark you don’t have to swap out the cleaner head. On the Dyson cordless vacuums, you get separate cleaner heads for cleaning hard floors and carpet. That’s the advantage of DuoClean. Do I Have To Hold A Trigger? There’s one thing about the Dyson cordless vacuums that you either love or you hate. The trigger. Shark cordless vacuums do not have a trigger, and you just push a button to turn it on or off. With Dyson, you have to pull the trigger to power on the vacuum and continue to hold it. The point of this is to allow you to squeeze all the battery life out of the vacuum and make sure you’re only running the vacuum on areas that you want to vacuum. This is really a personal preference, and we can’t say one is better than the other in this regard. Just know what you’re buying. The weight of the Shark stick vacuums are roughly the same at around 8 to 9 lbs. However, the Shark P50 being more like an upright is a few pounds heavier. Shark’s Powered Lift-Away feature allows you to detach the canister of the vacuum from the pipe that acts as its spine in upright mode and carry it in your other hand. So instead of having the majority of the weight of the vacuum in your dominant hand, you have just the handle and cleaner head in one hand, and the vacuum canister in the other. Some users find it more comfortable to use the Shark P50 in Lift-Away mode than it is to use any other cordless vacuum. It’s more maneuverable and reduces wrist strain. 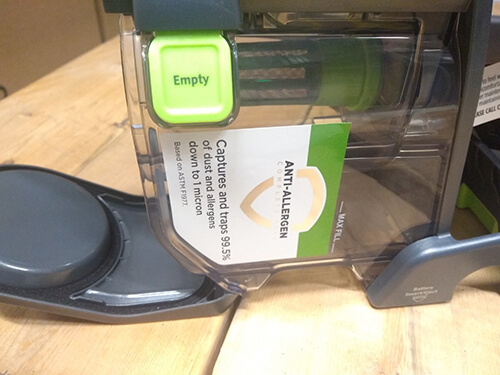 The only Shark cordless with Anti-Allergen Seal and HEPA filter is the Shark P50, at least at the time this was published. Pictured below, you can see the filter on the IF205, which is the same as the X40 and F80. The pre-motor filter is easy to access and clean. It’s a good idea to wash it once a month and let it dry for 24 hours before using it again. How does this compare to Dyson? Well, the Shark F80 and X40 have inferior filtration when compared to the Dyson V8 and V10. This is, yet again, another reason we prefer the Shark P50. When gauging a vacuums performance on various floor types, we want to see how well it picks up large (i.e., dog food) and small (i.e., fine dust) when vacuuming carpet and bare floors. Crevices between tile, wall corners, and wall base are also areas some vacuums struggle with, as suction sometimes doesn’t reach far enough. In several tests and demonstrations you can watch below, you can see a considerable improvement in the performance of Shark’s DuoClean cleaner heads over the older vacuum models. This is why we recommend only buying a Shark vacuum with either the DuoClean or Zero-M cleaner heads. Zero-M isn’t available on cordless models yet, but we expect that’s on Shark’s to-do list. It’s not a problem. See, the old solution to vacuuming on tile or hardwood has usually been to completely turn off the brushroll, slow it down, or just hope for the best. The DuoClean cleaner head is Shark’s attempt to do better than that. Mainly because turning off the brushroll and getting zero brushing action on bare floors leaves behind fine dust and anything the suction alone can’t pick up. The brushroll on the front that looks like a paint roller is soft and will pick up fine dust and help throw debris into the suction channel instead of relying on suction alone. The DuoClean cleaner head works so well that the power requirements for many of the Shark vacuums are lower, yet they do a better job at cleaning all floor surfaces and debris types than the older models. The floor cleaning ability of the DuoClean cleaner head on the P50 is arguably one of the best available. You don’t have to swap out cleaner heads for bare floors and carpet. The DuoClean handles both. Sand, pet hair, large debris (like cereal) are easily picked up. You can easily push a button with your thumb to speed up or slow down the brushroll. About 30 minutes of battery life with the cleaner head attached. The floor cleaning ability of the DuoClean cleaner head on the F80 performs just as well as the P50. The debris pickup ability of the F80 is just as impressive as the P50. The dustbin is smaller than the one on the P50. You get 2 batteries, typical crevice/duster attachments, and a smaller crevice tool with a hose for cleaning vehicles. The F80 stands on its own by using the MultiFLEX feature to let the handheld rest just above the cleaner head. Battery life is better than any other cordless vacuum. How do they compare with the Dyson V10? The big difference between the Dyson cordless vacuums and the Shark ION models is that you have to swap out the cleaner head on the Dyson if you want to use the hard floor attachment. The DuoClean is much more convenient, and you can seamlessly transition from different flooring types by just hitting a button on the handheld with your thumb. As you can see, the DuoClean has no trouble picking up things as large as breakfast cereal or as small as flour. Using the standard cleaner head on the Dyson, we have seen some people have trouble picking up larger debris on bare floors, but using the hard floor attachment eliminates this problem. In our opinion, the convenience of the Shark ION vacuums wins over the Dyson. When you factor in price, the Shark looks even better. There are several reasons why we believe the Shark ION F80 to be superior to the Dyson V10. With the DuoClean cleaner head, you don’t have to swap out another cleaner head when you change to hard floors or carpet. It’s all-in-one. 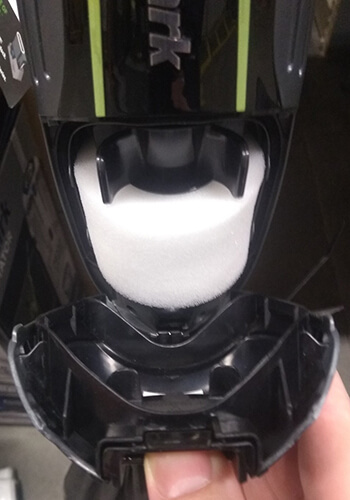 The cleaner head lid comes off by pushing a button, and that makes it easier to clean. Shark’s cordless vacuums have removable batteries. You can get double the runtime by just swapping the battery. Dyson’s is not removable. The Shark P50’s Lift-Away Mode is extremely convenient and versatile, and we think it’s superior to even the F80 stick. Stubborn design decisions, like the non-removable battery, make the Dyson a tough sell. We’re not going to list it as a negative, but Dyson’s trigger is a point of contention for some people. In many cases, there just isn’t any added value from having to pull the trigger to power the vacuum. So that’s it. Our top pick is the Shark ION P50 Cordless Upright.